As a Physiotherapist AND bike fitter, you are always observing. Always looking at the fine details that someone else may not pay attention to, the wear on the inside of the shoe, the saddle that’s off centre, the brake lever that has crash damage. When undertaking a history from the client these are all valuable snippets of information, and usually unspoken unless something triggers a particular memory. Now it can be argued most bike fits start at the feet, unless there is something else ragingly obvious. Even the most die hard of aero fans cannot argue with optimising the foot, as this is ultimately where you apply force to propel the bicycle. In fact, the position of the cyclist can fluctuate significantly when the shoe changes. Take for example a shoe that is too big. More often than not the cleats will be positioned further forward due to the cleat holes, which has a relative effect on saddle height/leg length. So how do you ensure you find the right shoe for you? Also consider the cleat/shoe interface, and shoe/foot interface e.g. insoles, but discussion around these topics is a whole other blog. First of all look for a shoe that fits your foot shape. Shoe shape is determined by the shape of the last. If you have a planus foot e.g. flattened arches, then a straight last or a semi curved last are potentially more appropriate. If you have a supinated foot, or a foot that curves (e.g metatarsus adductus) a curved last is more appropriate. Next, ensure the shoe you are buying fits your foot length. 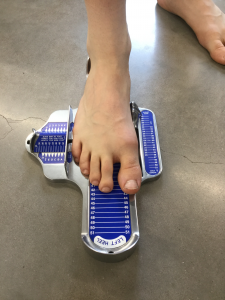 A Brannock device is a great way to ascertain your shoe size, typically with cycling shoes you would “size up” – half/full size to allow your foot sufficient room in the shoe, and also scope to expand as it gets hotter and splays under load. 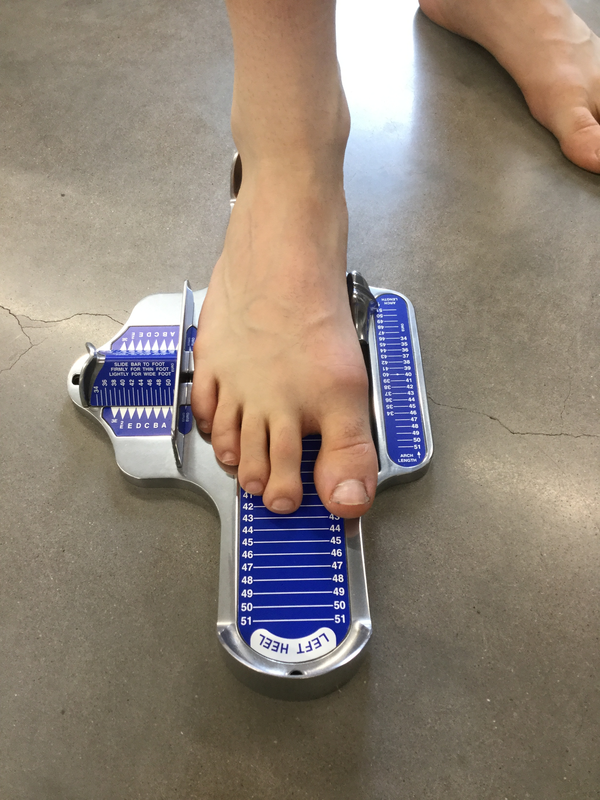 However, if your foot is in a heavily pronated position, this could change your shoe size by sometimes 1-2 sizes, as if placed in the anatomical “subtalar neutral” position, your arch will usually shorten and thus the foot will shorten. Just like with ordinary shoes, brands will vary in their sizing, therefore don’t always assume you are the same across the board, as there are other variables at play, including the volume. The volume of the shoe will depend on your individual factors. It’s possible to have a slim foot with a high volume (because the arch is high), as well as a wide foot with a high volume. Lake, Shimano, Giro, SIDI and Specialized all offer wide fit versions of their standard shoes. 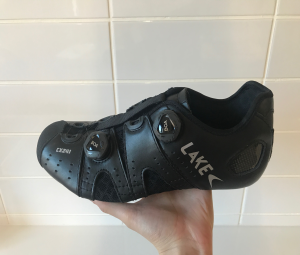 Lake have a wide range of shoes that fit varying foot shapes/volumes therefore cater across the board, although it’s usually problems finding shoes that are wide enough, rather than narrow enough. One important note is to aim for a shoe that compliments your overall volume, e.g. a slender heel with a wide toe would do better with a shoe volume that reflects this, so that your foot is gripped well within the shoe. Others who have a generally wide foot will need a shoe that is wider at the rear. There is a lot of variance on the shape of the toes which can dictate the toe box shape. Egyptian – when the toes cascade down in height. This means you will suit most shoes on the market. 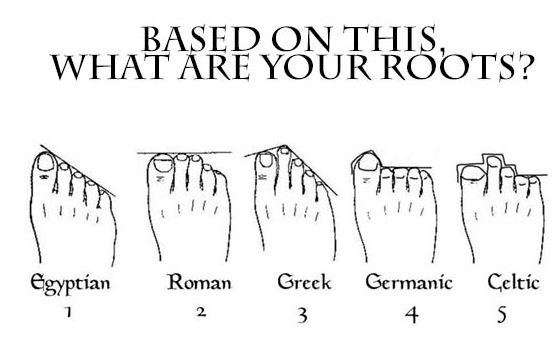 Germanic- your foot finishes in a square shape. If this is your foot shape, or your toes splay then you may need a wider toe box e.g Specialized, Bont or Lake to account for this. Morton’s foot (NOT PICTURED) – when the big toe isn’t as long as the second toe. This can make shoe sizing a little difficult, especially when the toe box slants inwards quickly, as the second toe can be prone to catching or rubbing. Materials are a commonly overlooked factor when it comes to shoes. Synthetic materials may optimise waterproofing, and longevity of the shoe, but they could cause the foot to become hot/sweat and therefore bigger, unless there is adequate ventilation. Giro Empire shoes although synthetic, have material that allows some give, so if you have any lumps and bumps they will be accommodated, or a foot that doesn’t quite fit the last shape. Other brands such as Lake use leather, but there is a wide variance on this within their range. Leather may allow your foot to breathe, and also adapt dependant on your individual foot anatomy e.g. Bunions. This shoe has flexi material in “all the right places”, and fully adjustable segments, perfect for the unorthodox foot. Ultimately there are shoes that are available to fit most foot types. It’s important to consider your individual factors when looking at shoes, as there usually is a solution for all (even in length, yes! ).